Culture Bore: Was Greco-Roman Sculpture Actually Painted? Was Greco-Roman Sculpture Actually Painted? We may have completely misunderstood Greco-Roman sculpture for centuries. In the years to either side of 1500, more and more ancient sculpture began to be recovered. Centuries of burial or neglect had bleached the marbles, and greened the bronzes, beyond their makers' recognition. 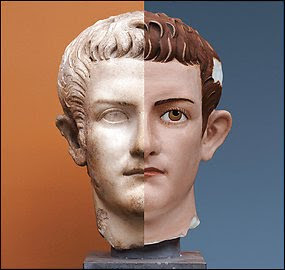 But it was those altered colors that became the model for how the ancient world had looked, and for what all new sculpture ought to look like. By 1764, Johann Joachim Winckelmann, often named as the founder of art history, could look at the classical marbles that had come down to him and definitively pronounce that "the whiter a body is, the more beautiful it is as well." That view went on to dominate. It led Lincoln in his Memorial to come out white on white. Destroying conventional historical wisdom aside, I think I prefer the painted versions of the statues, myself. China: Where Does It Go From Here?